Yvon started domaine bottling wines from the family run property in 1988 and now his son is working their six hectares alongside his father. From the few photos I have seen of his vineyards there are no trellising poles or finite rows from one end to the other. There is also extensive ground cover showing vibrant soil ecology. These parcels contain Gamay vines that range in age from 20 years to 120 years, and in particular vintages he makes a high-end cuvée from his Fleurie parcels called ‘Ultime’. Yet Yvon Métras is quite elusive. By elusive I mean in terms of availability in the USA. Yvon doesn’t want to deal with the paperwork hassles that come with exporting wine out of France so there are no official channels for acquiring the wines anywhere outside the country. The merchants of France are the only lucky recipients of direct shipments from the domaine. After that it takes astute connections and some temperature controlled cargo shipping across the pond for his wines to reach our shores. 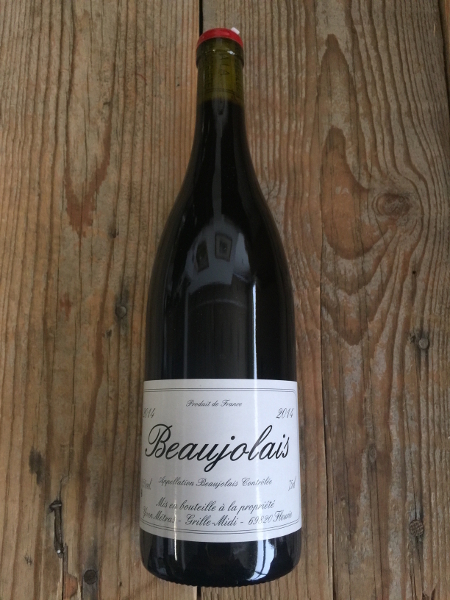 This Beaujolais designate wine actually comes from a single plot in Fleurie, on granite soils, but the elevation is too high, which led it to being de-classified per the AOC regulations.